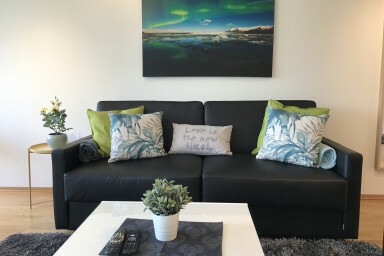 Flat by Sonderland Apartments with one bedroom, a living/dining room area with 2 sofa beds and a fully equipped kitchen. This accommodation by Sonderland Apartments has 1 bedroom, and a living/dining room area with 2 sofa beds and flat screen TV. There is space for 2 people in each sofa bed. They are high quality and have normal bed mattresses. One is 160 cm wide and the other is 140 cm wide. The apartment has an open kitchen equipped with utensils and tableware, a stove top, an oven, a fridge and freezer, a dishwasher, a toaster and a coffee machine. The bathroom has a shower and is equipped with a hair dryer, an iron, a washing machine and a tumble dryer. It has a balcony with a small seating area, an elevator and free Wi-Fi. Linens and towels are included but food items and shampoo is not provided. The Oslo Bus Terminal is a 4 minute walk away and it takes about 8 minutes to walk to the main train station. The subway station, tram and bus stops are a couple of blocks away, as well as cozy cafes, restaurants and the supermarket. Karl Johans gate, Oslo's main street with restaurants and shopping, is a 15 minute walk away.This street leads to the Royal Palace, Akershus Fortress and the lively waterfront Aker Brygge. An indoor parking space is available against a fee of NOK 200, please contact us for vacancy first. Please note the garage is 2.1m tall. If you expect to check-in after 10:00 pm, please contact us first, and note that there is a charge of NOK 250 for late check-ins.